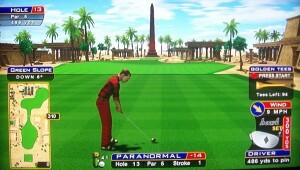 Here is the official preview of the Dahshur, Egypt course. 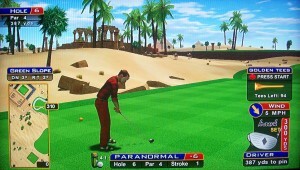 This post contains tips, tricks, and information related to the 2011 Golden Tee course Falcon Sands! Check out the hole-by-hole breakdowns and example hole-outs as I partner up with the Golden Tee community to give you the edge you need to beat your friends! For most players, you should be using the Hawks and Hurtles on this course. Bottom line — aim straight at the green and let it rip! You’ll almost always be shooting a B2 or other 180-type shot right at this green — even a medium-teed driver hit firmly will clear all the trees in the middle and on the right. 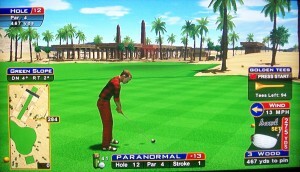 So, in most cases, just pretend the trees aren’t there, and focus on hitting the green. It’s slightly downhill, so it may not take as much power as you think. Here’s an example shot. Since this green is flat, landing anywhere on the green should be your priority! If the wind is at your back, you have even less to worry about. It will be almost impossible to land directly in the water short of the green, so you can potentially take advantage of the steps down to the green and let the bounce and wind carry your ball onto the green. Especially because of this, don’t be long!! If the wind is in your face, a high tee can be considered, since you might need the extra distance and your ball should settle nicely once it lands. This hole has a very low eagle rate, most likely because people are still scared of hitting the trees and are trying to cut the ball into the green. If you do need to play the C3 or C2-type shot, it can be beneficial to use the hill here — let it take care of deflecting the ball onto the green. Here’s a nice hole-out using the hill. Check out this wild deflection! Also, check out this helpful bounce! Here’s an example hole-out to a back pin. If you get a front pin, you can actually take advantage of the sand here. 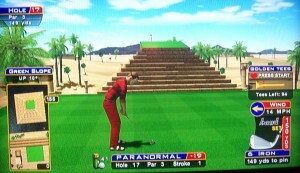 It’s elevated, so if you land short, the sand will stop the ball and let it trickle down onto the green by the pin! 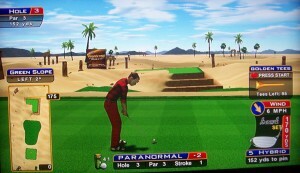 Even if you’re short, you can putt from this sand too since it’s downhill. Be careful though, because this can backfire — if you hit the downslope of the sand, it will shoot the ball forwards towards the back of the green. It should still hold the green, but you should certainly try to carry the green instead of relying on a helpful bounce from the sand! You should pretty much always blast a straight, high-teed driver out to the second fairway (here’s a hole-out from there). Even if you don’t get to the fairway, the desert sand is just fine too. The eagle rate seems too low on this hole too — this is one of the easiest par 5s in the game. The drive is easy, and the approach shot is easy from the second fairway and should lead to eagle. The first fairway still gives you opportunities to get there as well. Here’s a hole-out from the left side through a nice gap in the trees, and here’s a great sand-skipping hole-out from the end of that fairway! With some setups, you can use a high tee and blast a straight driver to the second fairway. This gives you a short iron, which you’ll want with some of the pin placements. The only danger is landing in an area where you might be in between clubs. Another fine option is to lay back short of the water — here’s an example hole-out. Even if you’re short on the approach here, you can get major hops off the sand! The only real danger here is if you’re left with a long iron, which might give problems because of the low loft. This would be a good hole to learn the right spot to lay back for a 5-wood! Even if you are 400 yards away, you should at least take a look at the setup for a rare chance to try to drive this green. A tail wind helps a lot. Aim right at the green with a high-teed driver, and let it rip. 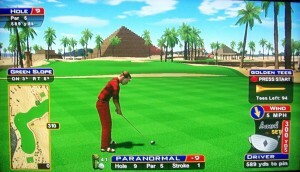 It should bounce off the pyramid structure and down onto the green. 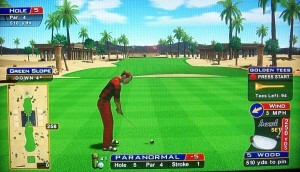 Even if you are on the fringe you can still putt downhill! 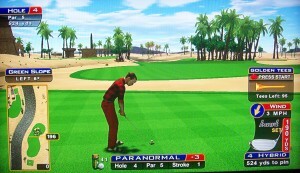 Aiming between the palm trees is the safest spot, since the high-teed driver still may not clear those trees. Here’s another fantastic ace! The Air-Os help a lot on this hole — here’s a high-teed driver with the Air-Os that went 414 yards into the cup! However, the risk usually outweighs the reward, because if you come up short, there’s a lot of trouble and you’ll be forced to lay up for par. Since the eagle rate is so low, it’s a fine play to lay up to the right in the fairway. Use your 3-wood if you can. If you are careless with your driver, you won’t have enough loft to carry the slight elevation to this fairway, and that would be a disaster! So, make sure you hit it firm, and then take your easy birdie and move on. First, you may get a look where you can poke one over the building through the gap. Here’s a medium-teed 4-wood with the Air-O balls that finds the cup, so you shouldn’t have a height issue with a 5-wood or a high-teed 3-wood either. 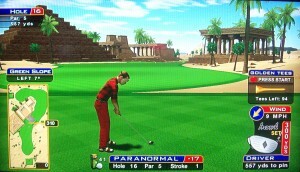 Normally, you’ll be curving a C3-type shot around the corner of the building into this green. Here’s a great C3 3-wood from the left side of the box. Here’s another 3-wood hole-out from the middle of the box, and here’s a driver hole-out from the middle as well. However, there can be trouble here if you aren’t accurate. If you miss just slightly long and right, your ball can trickle down into the water! And being short is definitely trouble too. To be safe, aim for the middle of the green — that way, if you’re a bit long or miss a bit to either side, you should still have a chip and retain your birdie. It will take practice to master distance control here. Finally, keep the small change in elevation in mind. You’re shooting a bit uphill, but not as much as it may appear! The reward outweighs the risk here, so always go for the green! This approach shot took a serious change in direction! This hole gives you a good shot at a hole-in-one, especially if you have low-lofted clubs in your bag! Here’s an example hole-out. No need to cut the corner here — if you hit it to the end of the straight part of the fairway, you still have plenty of club to get it there in two, and then you’ve taken the trees out of the way on your approach! Here’s one example hole-out. Use the 5-wood if you can to clear the structures in front of the green. If you have to club up, a 3-wood hit firmly should still clear the obstacles. Here’s a 9-wood that also stays left of the trees after a longer drive. Check out this fortuitous hop! Unfortunately, there’s nothing fancy you can do here to drive the green. Just lay out in the fairway — here’s an example hole-out. Here’s another shot that took advantage of a nice hop! Be wary of the tree guarding the left side of the green — it can knock down shots trying to come in from the left side, so I say just avoid that side altogether if feasible. There’s even a backstop on this one allowing you to be a bit more aggressive — check this one out! If you’re feeling aggressive and have the chush shot in your arsenal, you can sometimes cut the corner to within 50-75 yards to give that shot a try. However, there are too many pars being recorded on this hole, so don’t do anything dumb — make sure you have a good approach shot and stick it close. 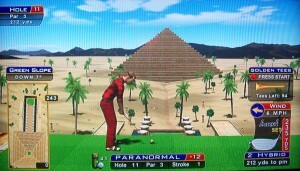 Here’s a great hole-out off the pyramid from a tee shot that went bad! A low-lofted club like a 2-iron certainly makes this hole easier, and here’s one with a 5-wood — if you have to use a 9-wood and there’s a strong wind, you’re in for an adventure! Even though the green slopes downhill, the wind should determine whether or not you use backspin. With a headwind, you’ll be wanting to just let the ball settle when it lands. A low tee can also be considered — the more wind effect you can eliminate, the better! When the pin is by the edge of the green, especially on the low side, your putt becomes crucial. If you miss, you’ll trickle off and have to chip back on, resulting in bogey or worse! I don’t always recommend lag putting, but doing so here could save you a stroke or more and get you out of here with a par. There’s normally no advantage to cutting the corner to the fairway strip, since you can reach the green just fine laying back — you’ll have a 3-wood or 5-wood, and both should work fine to stick the green. Here’s a hole-out from behind the sand. If you’re feeling adventurous or confident or get an easy look to the fairway strip, that’s fine too, but the risk just isn’t worth the reward. Anyway, here’s a hole-out from there. Somehow the wind blows this one all the way back! Also check out this great great deflection! If you land in the sand between, you’re in trouble — you can’t reach there in two, unless you do this! Here’s another trick shot! Many options off the tee here. The easiest shot is usually a C3 or an A1 past the neck of the fairway, depending on the wind and pin. With a pin on the left, I usually like to drive to the right, and vice versa. This way, you’ll curve the ball into the green towards the pin on the other side. It gets tricky if the pin is on the right and the wind blows left. In this situation, you’re probably best to play out left and cut a shot into the wind towards the pin (at worst you should find yourself in the middle of the green with a manageable putt). Be careful of the obelisk though — you’ll probably want to club up to keep the ball deep enough to curve around without a deflection. If you play in from the right, the wind will blow your ball to the other side of the green, and now you have an awful putt. 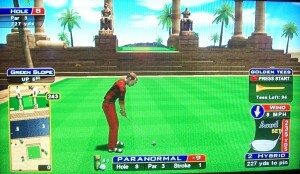 Putting is crucial here too because of the drop-off, and you can easily have a blow-up score here! Others disagree with this strategy and never want to fight the wind on the approach shot, regardless of the pin. This strategy is safer in terms of holding the green, but you’ll likely have a long, sloped, difficult putt. 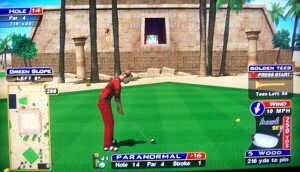 At least it’s a putt though! 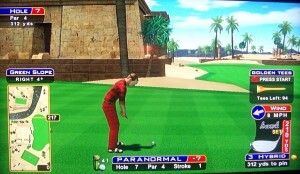 You’ll also notice there are shortcut squares of grass on both sides that offer a better angle into the green. You’re assuming some risk in trying to land these spots, but the reward might be worth it, and some players prefer this approach every time! Here’s a hole-out from the shortcut square on the left and here’s one from the shortcut square on the right. Check out this splash — wait, what? This one is fun! You will either be shooting through the hole in the building or going around the left side with a 5-wood (or 7-wood if you have one). Let’s talk about the shot through the hole first. If you’re playing the Hawks, then a low-teed 2-hybrid will always get through the hole, so you can then just concentrate on distance. From the front of the box, a medium-teed soft-thumbed driver does the trick — check out this great hole-out! From the middle of the box, a 2-iron will get through. Here’s a low-teed driver from the back of the box that worked. Have a 9-wood in your bag? Then you may have another option — tee it high and go right over the top! Finally, there are many setups that allow you to go around the left side — check out this great shot! You can pull off the around shot with a 5-wood also, but a 7-wood makes it much easier. Here’s another option — a 6-iron over the top with a tailwind if you’re towards the front of the box! Check out the amazing bounces on this shot! Finally, with the 7-wood, you can also go through or around the trees on the right side, giving you even more options based on your tee box and wind! 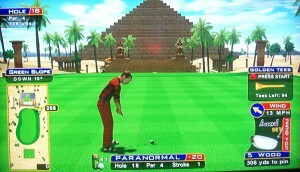 With a good setup, you can carry past the pyramid on the right and get an open look at the green with a short iron. A big A1-type shot is usually pretty safe to get the distance you need. With a bad setup, there’s no reason to get fancy off the tee — just lay back here and bring in a 5-wood. I don’t recommend laying back this far, but it makes for one heck of a hole-out! 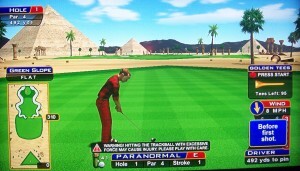 The approach shot is very tough here because of the awkward green, and you’ll almost always get a tough pin placement. Be happy with birdie here, but don’t be too frustrated with par. Most places off the tee are fine here — check out some of these examples to see some spots that work out. A 5-wood will clear the buildings and trees from most all spots assuming you have the distance to use that club. If the wind will be in your face on the approach, lay out closer to the structures. If the wind is at your back, stay in the middle or right side of the fairway. If you make it here, a 5-wood goes right over the top! Here’s another 5-wood clearing everything. Here’s another from a bit further back, and here’s one after a long drive around the corner. If you happen to carry to the little neck of the fairway, you can be rewarded with a look where the approach can go right through the building gap. Or, you can hit the gap from just short of this neck if you need the extra distance. If you end up anywhere else or don’t have the distance, you might need a 3-wood or 5-wood C3-type shot to curve around or through obstacles towards the green. This cool looking hole can provide a challenge with a stiff wind if you’re in between clubs. 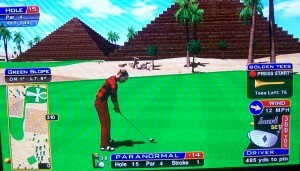 Even after sticking the green, you’ll still have a tough birdie putt! 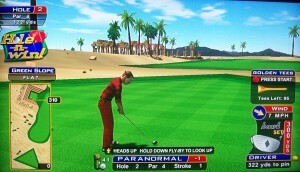 Lots of blow up potential on this hole, as you can see from the numbers — average score is only par, so be safe! Keep in mind the effects of the elevation here: cross winds still have a large effect, but tailwinds won’t affect you quite as much — tee shots may come in “hot”, reducing the impact of the slope, and the up 10 won’t stop the ball as quickly. Don’t over-compensate for a head-wind either since the ball won’t be in the air as long for the wind to pull it back! 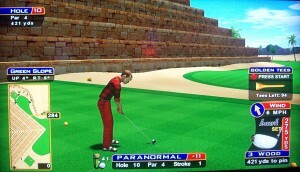 Even though you’re downhill, you still need loft to carry the wall blocking the green, so hit as much loft as you can! It’s actually better to be short, because from the sand on top of the building, you can at least chip and putt for birdie, instead of a long water ball really dampening your round. However, you can still end up pinned against the wall and have to waste a shot anyway! There are some cases where you will not want to use backspin — namely, if the pin is all the way in the back center and you have a head-wind. In this case, backspin will leave you too far away from the hole, so you’ll want to try to be accurate and let the ball dribble down towards the pin in the center of the green. Yes, this is difficult, but it’s your best shot at eagle with this setup. No putt is easy here because of the down 11 slope, and errant putts will find the water, so good luck! Here’s a 3-wood that played perfectly in this setup. In this case, the tee was at the back of the green, so a driver worked out well! Here’s a nice 3-wood to a tough pin. Check out the hop this 3-wood gets, earning a fantastic hole-out! Here’s a nice lofted 5-wood to a back pin. And check out this friendly hop on an angled shot! Here’s another fortunate hop with the 3-wood!